(June 7, 2018) — Greenberg Gibbons held a construction kick-off celebration today for Towson Row ― the $350 million mixed-use destination and new gateway to downtown Towson, MD. The company also announced that it has selected Gilbane Development Company to build the student housing portion of the project and Shamin Hotels to develop the hotel. Towson Row will be built on five acres between York Road, Towsontown Boulevard, Washington Avenue and Chesapeake Avenue. The 1.2 million-square-foot development will include over 100,000 square feet of retail/restaurant space, 150,000 square feet of Class A office space and 250 luxury high-rise residential units. Greenberg Gibbons is leading the development in joint venture with Caves Valley Partners. 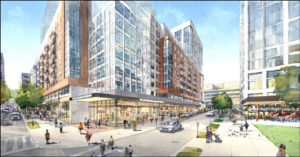 Gilbane, which has developed state-of-the-art student housing for over 120 colleges and universities, will build 300 student housing units for the project. Shamin Hotels, a hospitality industry leader that owns, operates and develops hotels under Hilton, Marriott, Intercontinental, Choice, Starwood and Hyatt brands, will develop the new hotel. Towson Row also brings significant economic benefits to the people of Towson, Baltimore County and the larger region. The project is anticipated to generate $220 million in annual business sales, create 5,500 jobs (2,000 permanent jobs and 3,500 construction jobs) and, when fully occupied, generate $92 million in annual employee compensation. At the kickoff celebration, Greenberg Gibbons also announced that it has purchased and will adapt the historic armory building on Washington Avenue located adjacent to Towson Row. The current vision for this property is to create a multi-use, innovation hub that attracts creative and entrepreneurial enterprises. Over the coming months, Greenberg Gibbons will continue to share updates on the look and style of the development with the community, as it simultaneously moves forward on making improvements to surrounding roads, sidewalks and other infrastructure. The developer estimates that the hotel and student housing components, both of which will include retail, will be completed in summer/fall 2020. For leasing information, click here.